A wise old man once said, “You get more flies with honey than you do with vinegar.” By now, the entire world knows that the banks are not innocent victims in this foreclosure debacle. However, this is not the time nor the place to make excuses, point fingers and play the blame game. This is the time to have a big slice of humble pie and ask for forgiveness. Recall from my previous blogs, that the forgiveness you are seeking must be based upon more than a poor real estate market or that you didn’t manage your finances well. There must be specific, personal reasons for you no longer being able to afford your home and you need to explain why your situation merits some “special treatment” from the Lender. Below are some common hardships. Many different hardships may come into play, so be creative, but truthful! Lastly, when writing a hardship letter, you need to keep in mind who your audience is. In a short sale, your audience is a party to the contract. This party loaned you a substantial amount of money that you promised to return. You failed to do so and now you are asking them to rip up the contract and throw it in the trash. Begging and pleading are not necessary; but remember that the ball is ultimately in their court. 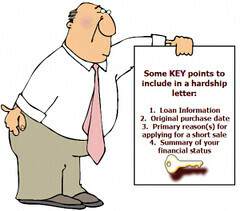 At the end of the day, there could be any number of “hardships” that may be deemed acceptable by the Lender. You just need to tell YOUR story the best you can. In conclusion, a short sale is a very important undertaking that should not be taken lightly. There are serious tax implications, high dollar deficiency judgments, and the new bankruptcy code that all must be analyzed to determine the right course of action. If you are falling behind on your mortgage payments or facing a foreclosure in Southwest Florida, you should speak to a licensed Florida attorney. If I can be of any assistance, feel free to contact me at the email address below. This is a generalized discussion on short sales in Florida and is not intended for any particular set of facts. By no means does this blog create an attorney-client relationship or privilege between the Attorney and the readers. If you would like schedule a free consultation, or have any questions, comments, or suggestions on upcoming topics, please comment below or email GuirguisLaw@gmail.com. Posted on July 18, 2012, in Legal and tagged Attorney, Deficiency Judgment, Foreclosure, Fort Myers, Hardship Letter, Lawyer, Legal Schmegal, Lender, Lien, Loan, Mortgage, Property Guiding, Realtor, Seller, Short Sale, SWFL Real Estate, Tax Implications, The Guirguis Law Firm, Vernon Guirguis. Bookmark the permalink. Leave a comment.